The new face of MMA, beginning primarily with a line of top quality fight and training wear made specifically with the MMA fighter in mind. SMAI is Bringing Fashion and functionality to training gear and fight wear apparel bearing this trademark. A collection of clothing and fight wear inspired and engineered to meet the needs of our MMA and martial arts teams. Velocity MMA Shin Insteps are solely designed for ultimate MMA fighting. Unlike the original Muay Thai model the Velocity shin instep is lighter in construction. Functionality was at the forefront when creating this Shin instep. SMAIâ€™s duo integration of Neoprene and Leather has created an excellent hybrid that allows for a realistic fighting experience. The Neoprene component reduces movement in training â€“ allowing you to focus on speed and agility. This lightweight construction is no way shy of protection. 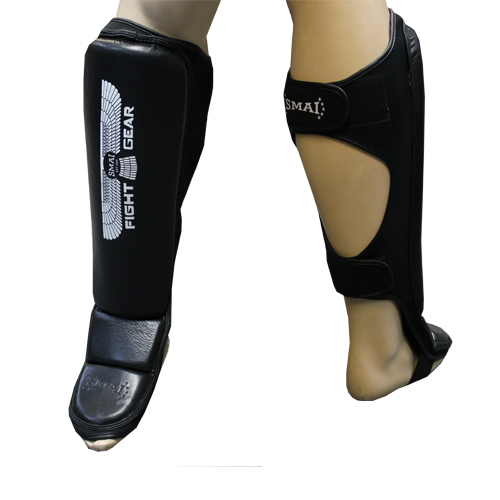 Single piece panels of EVA foam offer the highest level of shin protection.